When someone mentions a big tree, one would normally visualise it as a big TALL and possibly one with a super duper thick trunk. Well, I came across this pine tree and it was big in a different sense. Yes, it is rather tall but not as tall as those ancient trees that we can find in those national parks. It was big because it was very very wide. The span of the leaves and branches easily reaches 30 metres or even more. I can't really put a finger on it. All I remembered was that I had to stand very very far away just so that I can fit the entire tree into the camera's viewfinder. Then again, as you can see in the picture, I still couldn't fit it in. The trunks, according to the description sign below, is only a mere 60cm. With all the weight that spans the entire width of foliage, the trunk would probably snap and easily, if I may add. What you can't really see properly, in the picture, is that under the trees are steel scaffolding helping the tree to prop up all the branches. 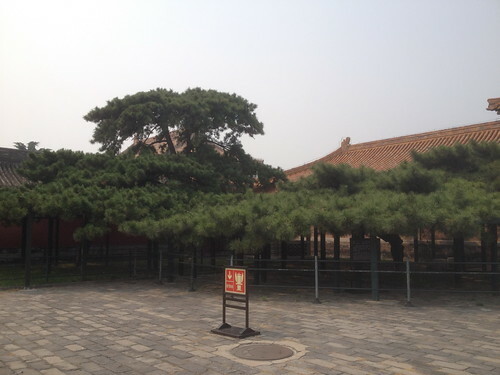 Interesting bit of nature there in the Forbidden City. 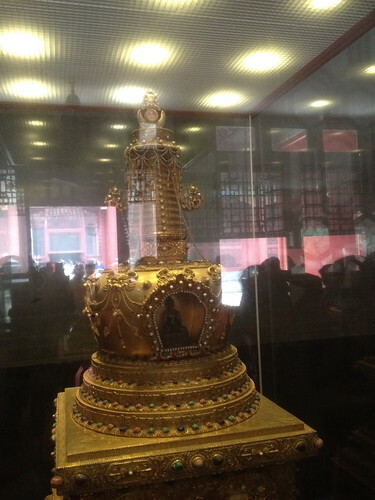 I learned many new words during my visit to the Forbidden City and the word "stupa" was one of them. A stupa is a Buddhist structure that commonly has some kind of a Buddhist relic or something of religious significance inside. This is going to be useful the next time I play scrabble. Haha. Anyway, the reason I feature this picture was the crescent moon on top that caught my eye. I was thinking if that was a symbol of the Islamic faith? I was wondering how cool it would be to be part of an item of the Buddhist faith. Perhaps the doctrine of co-existing religions in harmony?